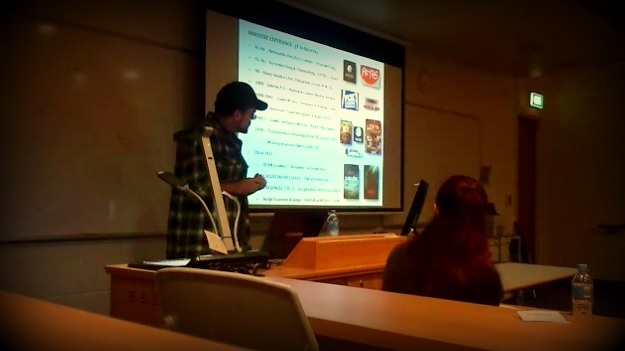 A summary of StoryAlity High-RoI (Return on Investment) Film Theory, in the `3-Minute Thesis’ competition, from `Interventions and Intersections: the 2013 UWS Postgraduate conference’. Last week (June 28th 2013) at the Interventions & Intersections: UWS 2013 Postgraduate conference I entered StoryAlity Theory in the 3-Minute Thesis competition. Here’s a recap of the presentation (and for more detail, including the rules of the 3 Minute Thesis – see the link above). I’ve also inserted extra diagrams below for clarity. 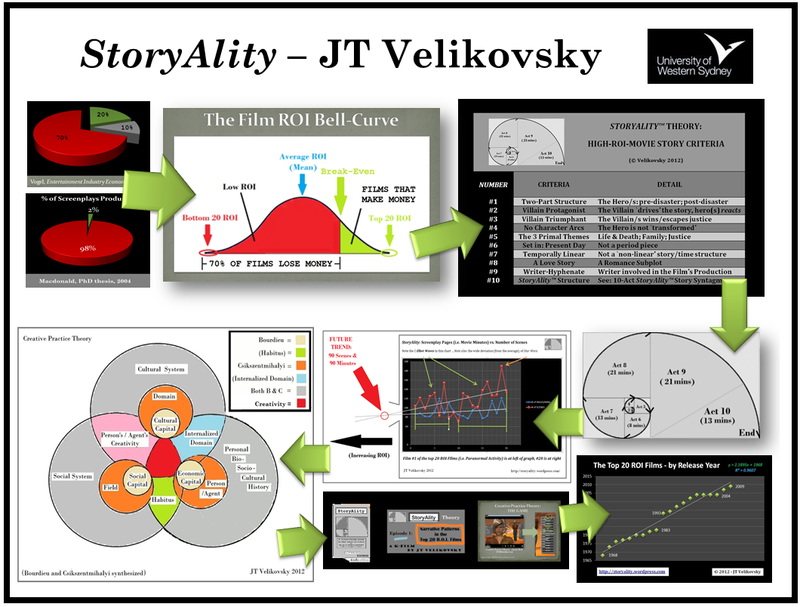 “StoryAlity: Scripting Successful Screen Stories” 3-Minute Thesis by JT Velikovsky, Doctoral candidate (Film/Screenwriting/Transmedia). Intro: (i.e. : Background) My name’s JT Velikovsky, and for the past 20 years I’ve been a screenwriter, a filmmaker, and also a story (film screenplay) analyst for major film studios such as Fox Studios, and PolyGram Films, and also for film funding bodies – and also I’m a film script/story assessor and judge, for the Writers’ Guild. (Literature Review) And – 20 years ago, while studying Screenwriting at film school (the AFTRS) I read 100 books on Screenwriting, and I summarized them all, into a writing textbook. It’s free, online, and is called The Feature Film Screenwriter’s Workbook. I’ve updated it 4 times in the past 20 years. 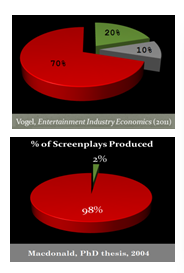 (1) [The 2 pie charts, top left] 7 in 10 movies lose money, and 98% of screenplays go unmade. Also – 90% of Australian filmmakers only ever make one feature film. It’s hard to have a sustainable career as a filmmaker, as – these are 3 `hard, real-world problems’ in the domain of Film. 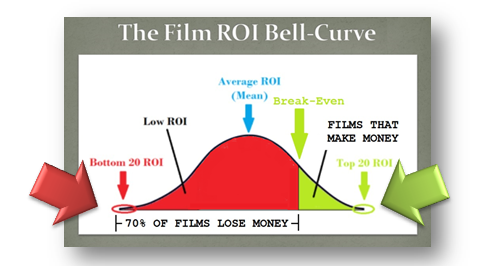 (2) [the Film RoI `bell-curve’ graph] My own approach to solving these 3 `hard problems’ in the Film Domain is: To examine Return On Investment in film. So, `high-RoI films’ are those that were made for the least budget – but had the widest audience reach – in other words, they are the films that went most viral in the culture, due to word-of-mouth – because of their Story. (a) their Story; (b) Screenplay; (c) Film; (d) Filmmaking Processes, and (e) the Individual Creativity of the key creators, behind each of the top 20 RoI films. (a) These films all have a two-part story structure – just as Aristotle said in Poetics (c335 BCE) – namely: before the tragedy – and then after the tragedy strikes: the ancient Greek play Oedipus Rex by Sophocles is a perfect example of that 2-part structure. (c) The top 20 RoI are all Villain Triumphant stories: the old “bad guys win” trope. Or, they’re `Tragedies’ in the Ancient Greek drama sense. (d) They have no `Character Arcs’; the heroes don’t learn, or `grow’, or change psychologically: often they are just trying to survive. (e) The top 20 RoI films all share the same 3 primal themes: (i) Survival, (ii) Family and Community, and (iii) Retributive Justice (Revenge). This leads into the field of Literary Darwinism, a la Joseph Carroll (1995), and also Consilience, a la EO Wilson (1998). 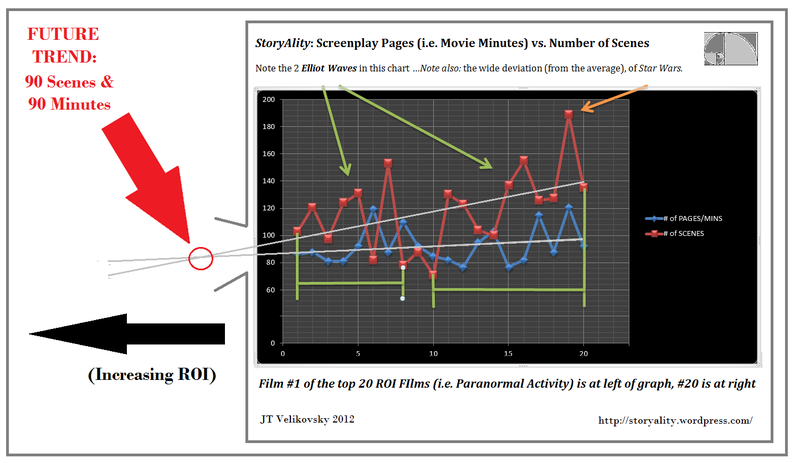 (4) [The Golden Spiral diagram] The Top 20 RoI film story structures all follow the Fibonacci sequence. They all do the same thing in their story, at the 1% mark, and the 2% mark, and 3%, 5%, 8%, 13%, 21%, and 34%, etcetera. The `maths nerds’ (and even, Big Bang Theory fans) among us, will recognize The Fibonacci Sequence, a.k.a. `The Golden Spiral’… So – maybe Plato was right, and there are `ideal forms’ behind nature. 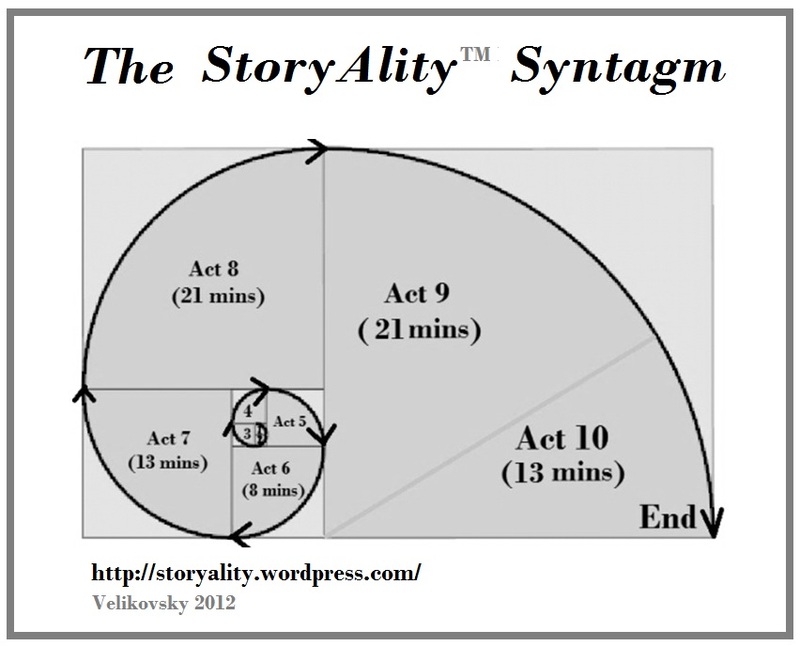 Aristotle, I’m actually not so sure about, with the whole “3 Acts” thing – as, the Bottom 20 RoI Films also have 3 Acts…But importantly – Aristotle never actually said “3 Acts” in Poetics anyway – he only ever said: A story has a “Beginning, Middle and End”. 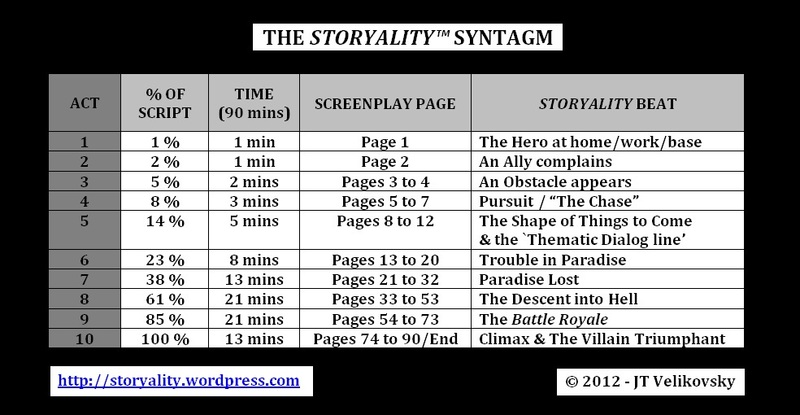 (5) [# of Scenes vs Film Duration chart] Turns out, the `ideal’ length for a Top 20 RoI film is 90 minutes, or 90 screenplay pages, and an average of, one scene per minute. This is helpful `pacing’ knowledge for a screenwriter, and filmmakers. For one thing, Why make a 120-minute story – when you can make it in 90 minutes, and therefore, save ¼ of the film budget, and use it across the rest of the film? 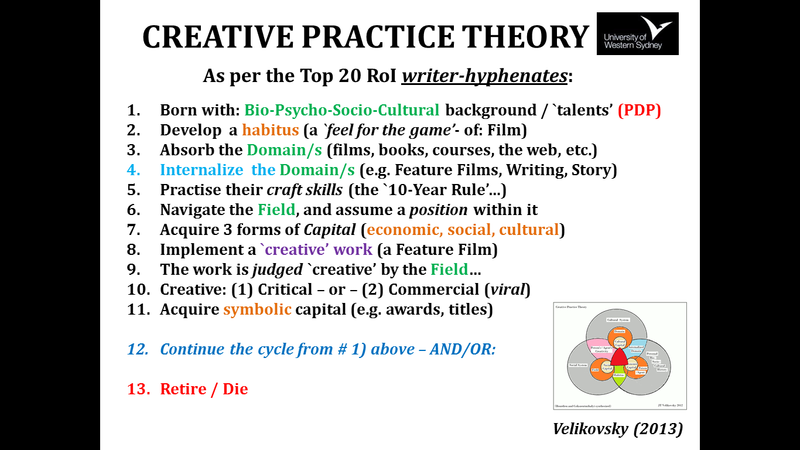 (6) [The `Creative Practice Theory’ diagram] The second most interesting thing is about the filmmakers themselves, and their creative process: all top 20 RoI filmmakers are writer-hyphenates, meaning: either, a writer-director, or a writer-producer, or a writer-actor, and sometimes – all 3 at once – such as in the film Primer (2004). And – in the course of my research – I’ve also discovered that, when we integrate Professor Csikszentmihalyi’s systems model of creativity (1988, 1996, 2000, 2006) with Professor Bourdieu’s practice theory of cultural production (1993),ten `steps’ appear, that all 20 of the Top 20 RoI filmmakers went through, in creating these `20 most viral films ever’. This knowledge too, also can greatly help writers, and filmmakers with their own creativity. 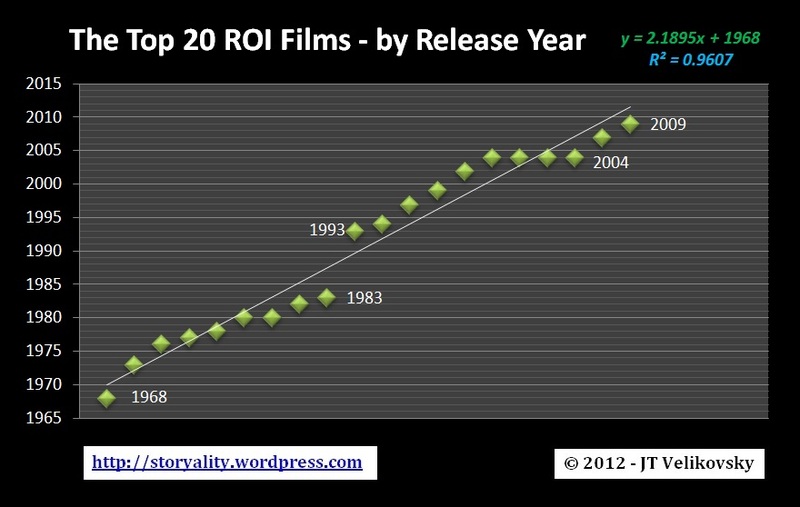 (8) And finally, I hereby predict – the next Top 20 RoI Film will appear, in 2014. 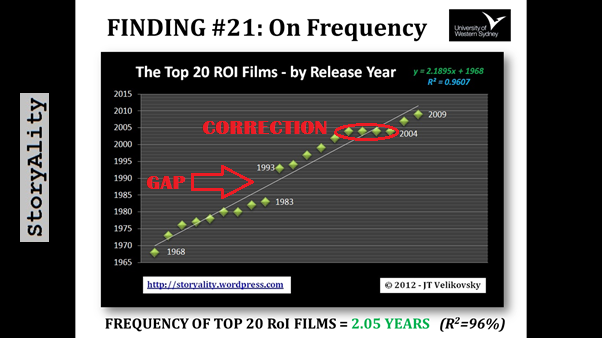 The reason for this is – when I plotted out the Frequency – of the emergence of the Top 20 RoI Films – I’ve also discovered that, they occur – with fairly-astonishing regularity – every 2.05 years, on average. The last film was The Devil Inside, (2012). 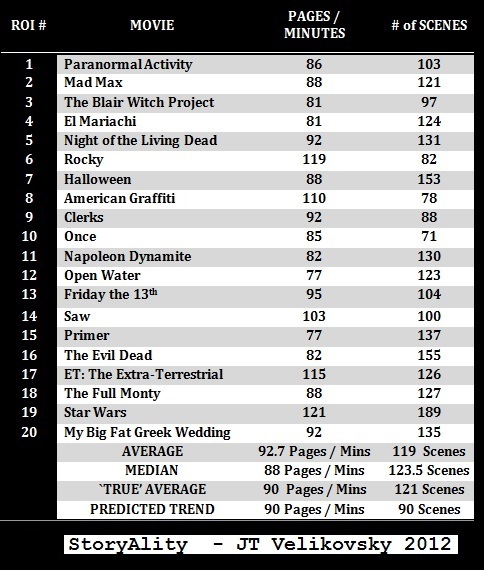 So if it arrives on time, the next Top 20 RoI film will be in 2014. (In fact January 2014 to be exact). There was actually a 10-year gap, from 1983-93, but then, in 2004 – four Top 20 RoI films all appeared at once – and then, we go back to them appearing every 2.05 years or so, and so – this “black swan” event in 2004 is what they would call a `market correction’ in the stock market, and also strongly suggests a system in operation – such as in the systems model of creativity, or indeed, in Creative Practice Theory. 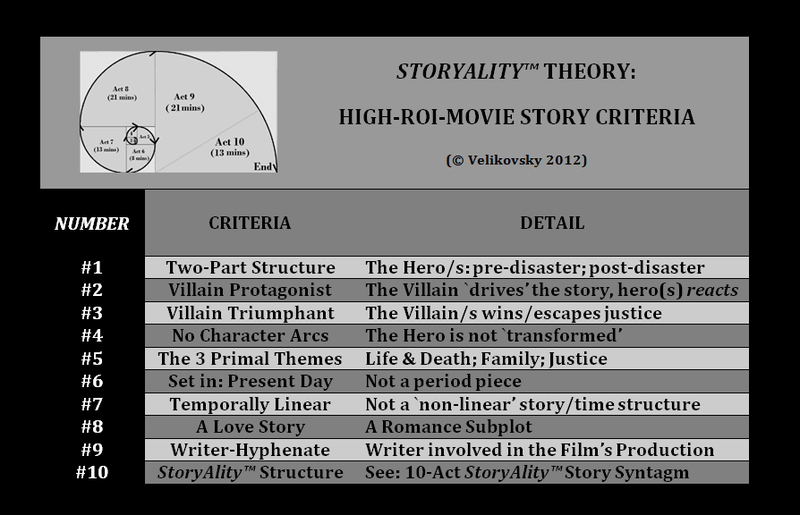 And let’s see how I go, with this prediction of StoryAlity Theory: you heard it here, first – I believe the next Top 20 RoI Film is due, in January 2014. So, I hope this research goes towards solving those 3 real-world problems in the domain of Film – and that, this new knowledge means, that screenwriters and filmmakers can hopefully have more sustainable careers, and – I hope that it also means, that we all get to see better film stories, when we go to the cinema! So, that’s a 3-minute summary of my ongoing doctoral research – Thanks for listening. So – that was my `full’ 3MT speech. (The last part of which, never actually got delivered. Oh well, there’s always next year. Then again – I hope a Top 20 RoI film hasn’t already entered the list by July 2014 – by the next 3MT competition – or, my prediction will have to be a retrodiction, like The Devil Inside, 2012. Then we’ll have to wait 2.05 years again, to see if those exact StoryAlity predictions are still working. i.e. 2016). One problem is these films appear to emerge from the international film system in a way that is Poisson-distributed (something like radioactive-decay emissions; their frequency is unpredictable over small scales of time, but a clear pattern/`rate of emission’ emerges, over larger scales of time.). 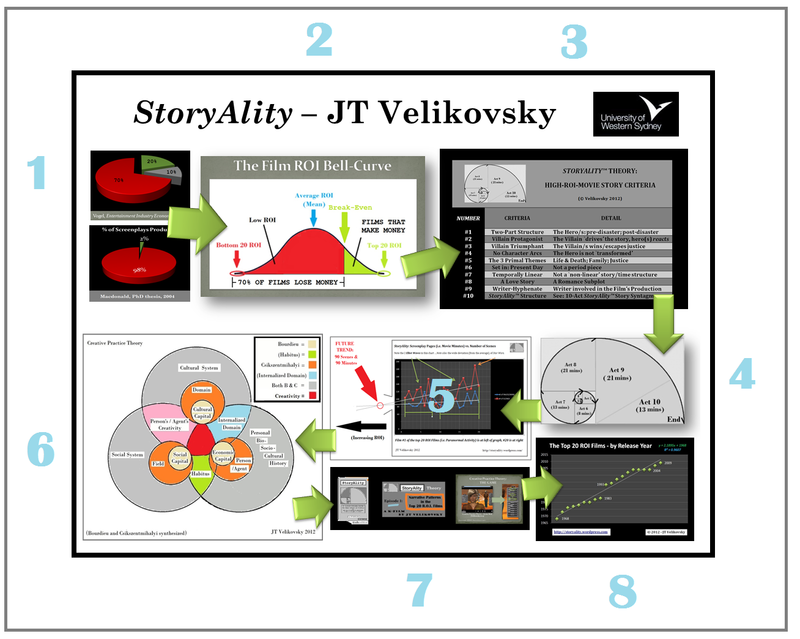 And, if StoryAlity Theory is new to you, maybe watch the 30-min online interactive documentary. And: if you’ve seen the movie, read the book! And maybe even, read the blog.